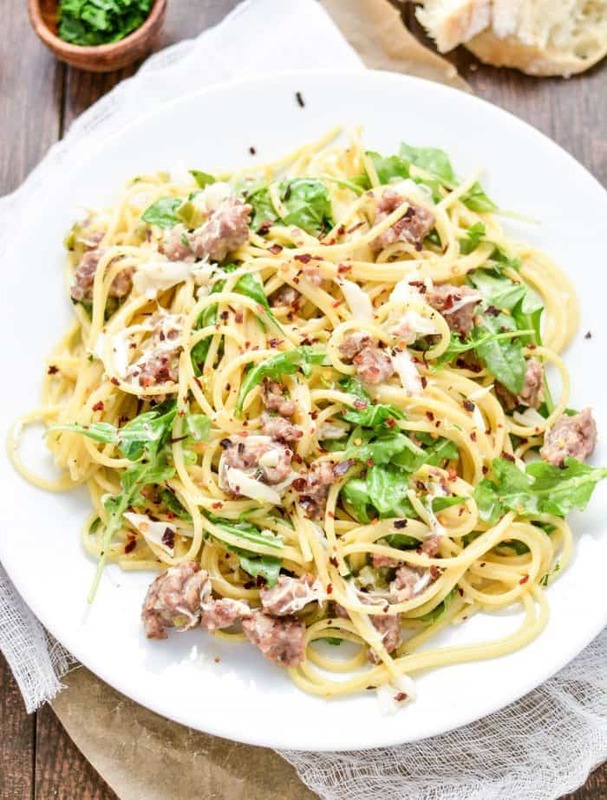 Creamy brown butter pasta with sausage and crab is a simple and quick weeknight dinner recipe that’s packed with flavor. 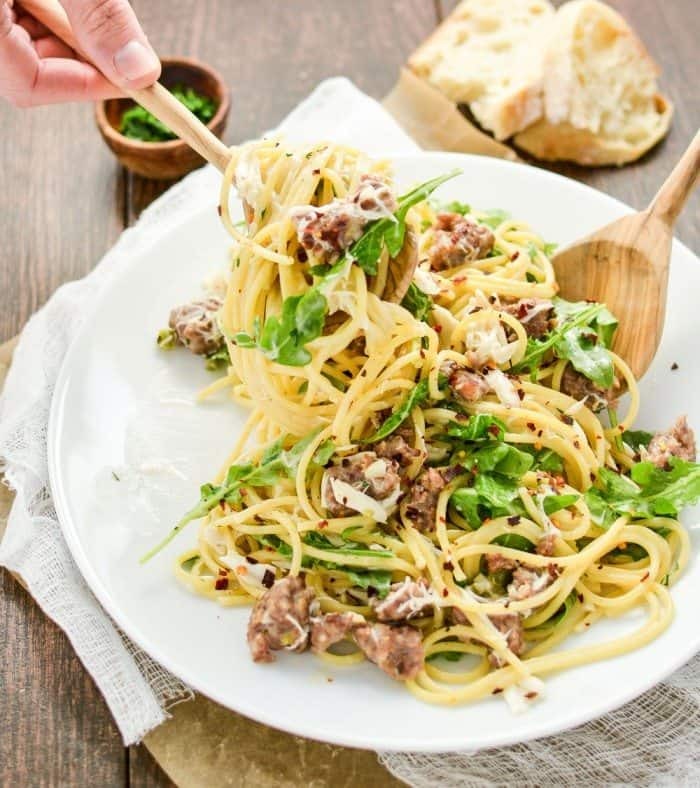 From the buttery crab to the savory sausage, and the creamy sauce to the peppery arugula, you and your family will be begging for seconds and thirds! Whether it is the dead of winter or the middle of summer, one thing remains to stay the same, my desire for all things pasta-related. 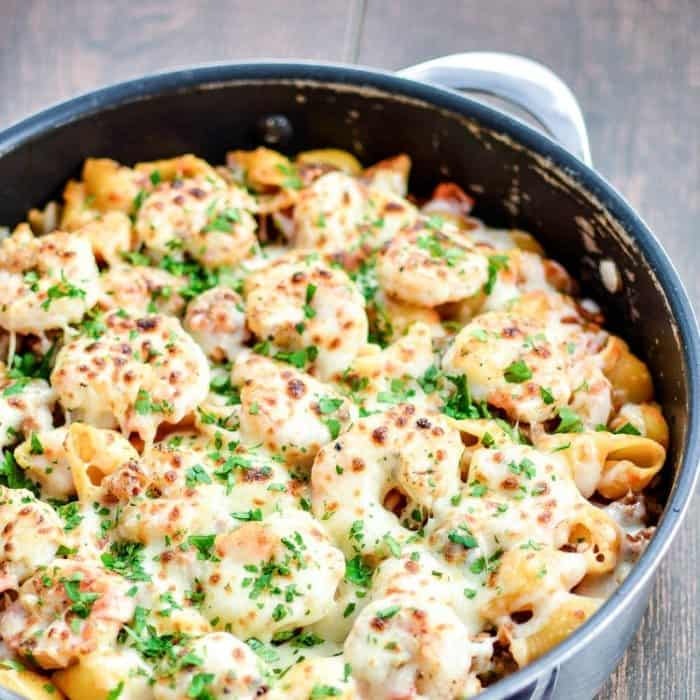 There is just something so comforting about pasta, and with us on the brink of the summer season, I thought sharing this funky spin on surf and turf would be the perfect transition dish. Pasta is amazing in so many ways. It’s the perfect blank canvas. From fragrant tomato sauces to easy pesto, the sky is the limit on what you can put on pasta. Hey, I have even been known to throw a pat of butter on a plate of pasta and call it a day! While I pride myself on trying to serve fresh pasta as often as humanly possible, sometimes it’s just not feasible. This is OK. Dry pastas have their special place in this world, and dry spaghetti is the only route I would go for a dish such as this creamy brown butter pasta. OK, so this dish is not exactly what you may think of as a traditional surf and turf dish. There is no lobster. There is no steak, but there is crab and there is sausage…which is really not the same at all, but in the end, it is surf and turf. Fresh seafood isn’t the easiest thing to come by in the middle of Wyoming. That being said, we do get a fairly good amount of sustainable, wild-caught crab. We tend to eat it as soon as we see it gracing the shelves of our local market. This dish is kind of like an ode to my love for crab, and takes me straight back to growing up on the east coast. The salty sausage really compliments the buttery crab. The two just kind of balance one another, which is all kinds of awesome. 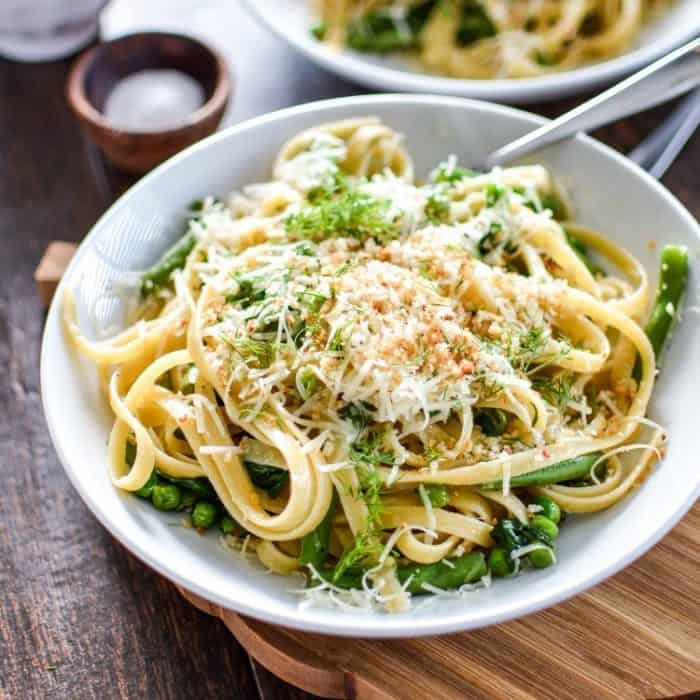 The peppery arugula gives it that kick of freshness, and the white wine gives it a subtle bite that really tones down the heavy cream. 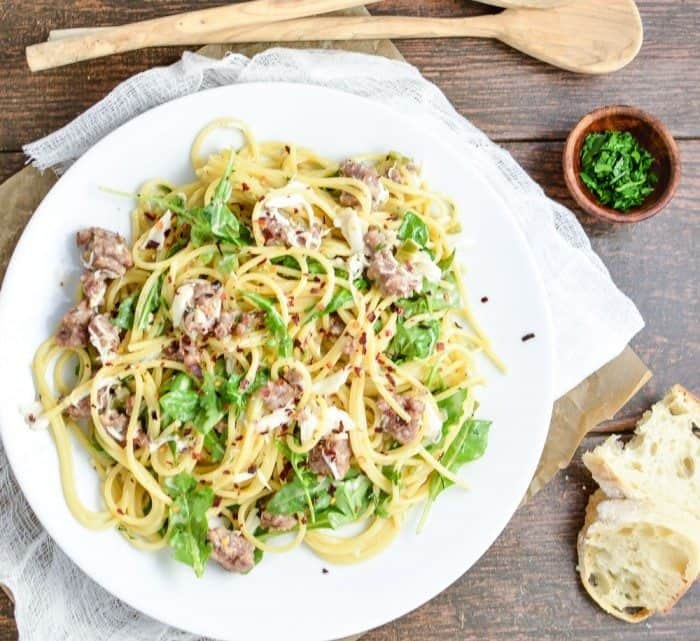 This pasta dish is a must-make as we transition into the warmest months of the year! 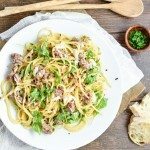 I hope you can find some comfort in this creamy brown butter pasta with sausage and crab. It is the perfect weeknight dinner recipe that’s simple to make and loaded with flavor! Bring a large pot of water to a boil. Salt the water and add the pasta. Cook until al dente, about 8 minutes, then drain (setting aside about 1/2 cup of pasta water) and set aside. While the water is coming to a boil and the pasta is cooking, add the sausage to a large nonstick skillet set over medium heat. Cook until brown and cooked through, about 8 minutes. Transfer the sausage to a plate that has been lined with a paper towel. Wipe the pan with a paper towel to get rid of most of the grease. You may even pour the grease into a small bowl and discard once cool. Add the butter to the pan, and melt over medium low heat. Continue cooking it until brown bits form on the bottom of the pan and it begins to brown. As soon as it begins to brown, whisk in the flour. This has to be done immediately. Otherwise the butter may burn, and then you will have to start all over again. Cook for about 1 minute, whisking constantly. Whisk in the white wine and continue whisking until the wine has reduced just a little bit, about 2 minutes. Whisk in the heavy cream and bring to a simmer. Reduce the heat to low and allow the sauce to thicken for about 4 minutes. Season with salt and black pepper, and add a pinch of crushed red pepper. Stir in the crab meat and cook for about 2 minutes to heat through. Return the sausage to the pan and add the arugula. Toss to combine. Transfer the pasta to the skillet and add the reserved 1/2 cup of pasta water. Toss to combine fully. Adjust seasoning to taste. 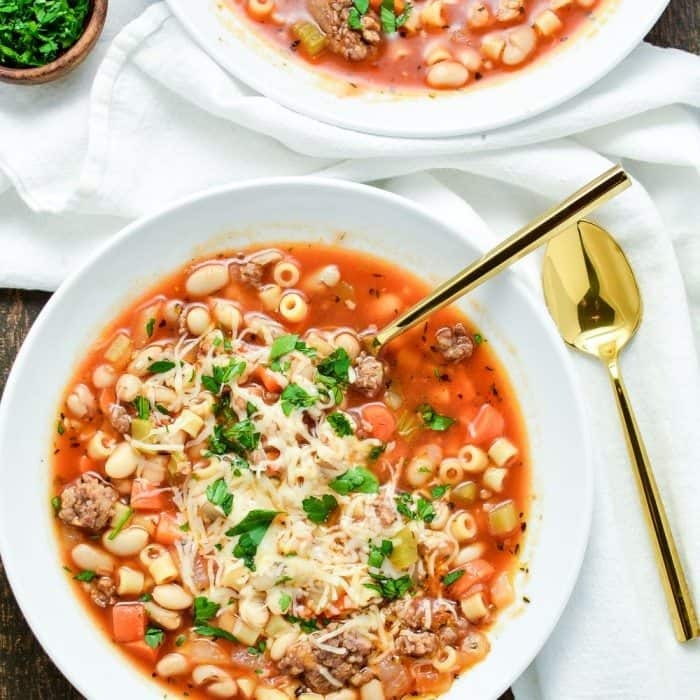 Serve the pasta immediately garnished with grated parmesan cheese, crushed red pepper, and chopped fresh parsley. Serve with fresh bread and enjoy! Like what you see today? Check out some other pasta recipes found over on Cooking and Beer where I’m combining bold and inspirational cooking (and baking) with the best craft beer I can get my hands on! I made this and it was a hit with both the kids and adults at our last family dinner. I used champagne and angel hair pasta and added 2 cloves of minced garlic for an extra kick. Highly recommended. Thanks for sharing.